You should be preparing you r home for spring, not just inside but outside as well. One part of your home that needs special attention as seasons shift: your gutters. Your gutters prevent your home from water damage and it’s important to maintain them as snow melts and rain starts. To get ready for spring and the rainy weather that comes with it, you should clear out debris in your gutter from the winter months. Things such as leaves, twigs, branches, and otherwise should be cleared out completely from your gutters. In order to clean out your gutters, it’s important to have the necessary tools and equipment. You should have a drill and bits, towels, a bucket, and a ladder. You should also have someone watching or nearby when you clean out your gutters because it can be a dangerous job. As spring progresses, you’ll want to make sure that you are cleaning out your gutters every few months. Spring will put a lot of pollen, flower petals, leaves, maple “helicopters” and dirt into your gutters. You will want to start with cleaning the gutter near the downspout first and remove the largest debris first. For getting rid of any built-up dirt, flush the gutter lengths with a hose starting at the end opposite the downspout. If the water doesn’t drain out of the downspout, check the downspout strainer. For standing water in the gutters, the gutter might not be sloped right and will require adjustment to get rid of the water. There should be a slight decline of at least ¼ inch every 10 feet toward the downspout. If you notice any leaks in the gutter, you may need to run a bead of gutter sealant on both sides of all joints. You can also use gutter touch-up paint to cover any blemishes. Bell Seamless Gutters provides a full range of gutter services including installation, gutter guards, and rainwater collection. For assistance with cleaning and maintaining your gutters, give us a call. If you don’t feel the need to have gutter guards, then here’s a how you properly clean your gutters. First, it’s always good to clean your gutters at least twice a year – once after fall, and the other after spring, when the seeds some down. Move your ladder to the corner of the house opposite of where the down spout is. You’re going to want to run water there down to the other end to wash and clean some of the leaves and debris to the downspout. Climb up your ladder with the water running through the hose and start cleaning out the leaves out of the gutter with your hands and either put it in a bucket that’s attached to the gutter with a hook. 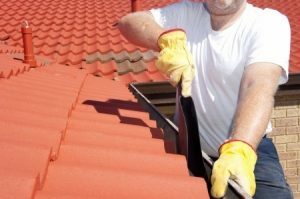 As you clean a section of the gutter, move down the line and continue to clean. You can leave the gutter at the corner of the house until you reach the down spout. If the downspout is clogged, which it very well be, shake or knock the down spout to loosen the debris and leaves, or remove the down spout to clean the debris. This may need to take place on a ladder, so be careful. That’s how you clean your gutters!